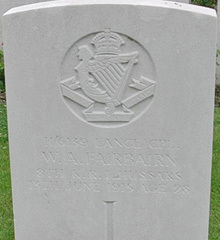 William Andrew Fairbairn was the son of Thomas and Margaret Fairbairn, of McKee's Terrace, Dungannon, Co. Tyrone. He was born about 1892.Thomas was a butter and egg merchant. Lance Corporal William Andrew Fairbairn was serving with "B" Squadron, of the 8th (King's Royal Irish) Hussars when he was killed on 13th June 1915, aged 28.